What does YOUR successful 2019 look like? Can you envision yourself making big moves, getting all the things done, and loving every minute of it? Or does the coming year look a little…ill-defined? 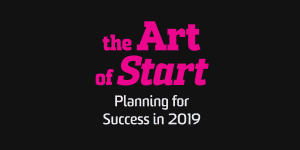 If you can’t see what next year looks like and need to add a little clarity to your vision, join us for The Art of Start. We are inviting entrepreneurs to share their stories & challenges — and to set goals and define strategies for 2019 in a friendly and supportive environment. Join entrepreneur and facilitator Bri Larson for an hour of inspiration, motivation, and a giant leap into the new year! Don’t Know Why? If, like Norah Jones, you don’t know why and you feel empty as a drum, then it’s time to get clear on your purpose and nail down exactly why you’re an entrepreneur to begin with. Bite the Elephant. The only way to eat an elephant? Is one bite at a time. Discover how to set tangible and feasible goals that will serve as the building blocks of your 1-year plan. Call Your Shot. Because the key to hitting your target? Is defining it in a measurable way. Ideation! Time permitting, we’ll talk about business growth, partnerships, competition, scaling, and all of those business-y concepts you need to know in order to succeed. Ticket includes light lunch, coffee or tea. Any questions? Email us at hello@okcolab.com. Bri Larson’s entrepreneurial journey started almost 20 years ago, when she served as a training facilitator for Starbucks, The Canadian Red Cross, The Canada Line, and others. Bri later delivered experiential training seminars and mentored trainees for the Choices Personal Growth Seminar. She developed a deep-rooted passion for leadership training, personal development, and mentoring others to reach their goals. She is now the owner of 4 companies across 4 different industries. Bri’s core beliefs stem from hard work, positivity, continual education and always enthusiasticallyenjoying whatever you’re doing.